Over 10 years of engineering and development yielded the Misty 8, part of the latest fleet of personal misters from MistyMate, with an all-new cutting-edge design years ahead of its time. Misty 8 is the world’s most advanced personal mister. Over 10 years of engineering and development yielded the Misty 8, part of the latest fleet of personal misters from MistyMate, with an all-new cutting-edge design years ahead of its time. 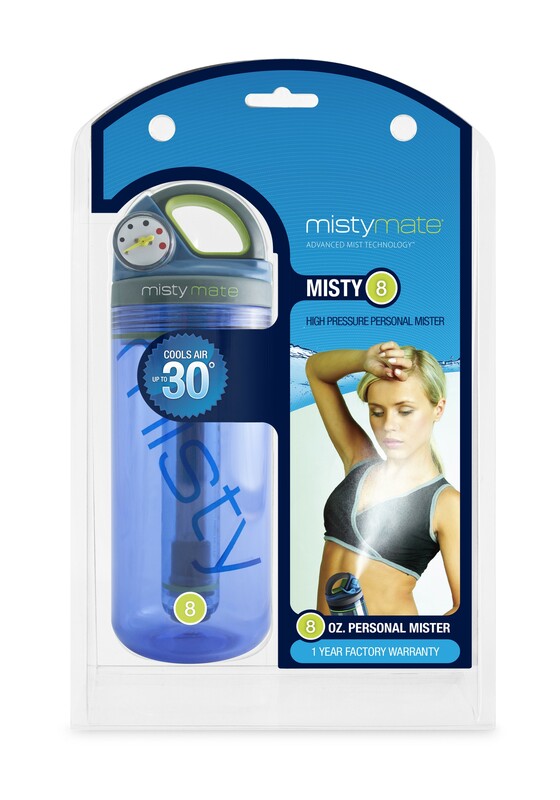 With a fluid capacity of 8 oz, the Misty 8 delivers ultimate micro-misting performance to keep you cool anytime in the sun or sand. This next generation hand-held personal mister has no motorized parts and requires no batteries. Instead, it pressurizes by hand to deliver a continuous stream of ultra-fine mist on command. • Pressurizes easily with built-in hand pump. • Features integrated valve for switching "on" the mist. • Pressure gauge allows you to regulate pressure inside the bottle. • Fits in standard cup holders on a golf cart, treadmill, boat, bicycle etc. "I am an electrical contractor and work outside 90% of the time. In the summer it gets so Hot and Humid the heat drains all of my energy. I have tried a number of products to reduce the heat but found nothing to help me until Misty Mate!